The figures for child homelessness have been slated as “terrifying” by the Church of Ireland Primate as he appealed to the Government to heed the needs of those trapped in homelessness. 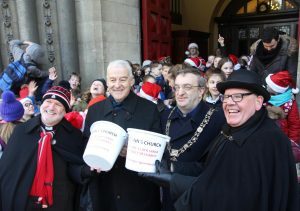 On Wednesday, Archbishop Michael Jackson and the Lord Mayor of Dublin, Mícheál MacDonncha, launched the annual Black Santa Sit Out at St Ann’s Church in Dawson Street, which raises up to €50,000 for homeless charities as well as the Laura Lynn Foundation. Speaking to CatholicIreland.net, the Lord Mayor said he was concerned that more rough sleepers could die on the streets due to a lack of “sufficient safety nets”. The Sinn Féin councillor said the best present the Government could give the homeless this Christmas would be to fund additional accommodation particularly for Housing First, which would take people directly off the streets. “They could also announce a major policy change that they intend to move ahead with social and affordable housing; we need 10,000 per year to really address this problem,” Cllr MacDonncha said and added that another great present the Government could give the homeless would be to announce that they are no longer going to rely on the private rented sector to address the homeless crisis “because that will not solve it”. As the children from Kildare Place National School began singing carols for the Black Santa appeal, Archbishop Jackson told CatholicIreland.net that “Christmas brings home to all of us the tragedy of homelessness”. He lamented the fact that more and more people seem to be living without “a recognisable home” which he said was “a tragedy particularly for children”. Canon David Gillespie, Vicar of St Ann’s and Dublin’s Black Santa, said he hoped that this year’s sit out would be a “bumper” one now that the Luas is operating. Last year’s street donations were down 50% due to the Luas works. This year the Black Santa will be joined by a number of choirs who will sing festive songs and carols each lunchtime. These include Castleknock National School, St James Primary School, Francis Street CBS, St Stephen’s Church Choir, Catholic University School, Taney Parish Junior School, Alexandra College, Kildare Place National School, Cornucopia Brass Group, Irish Life Choir, Revenue Choir, AIB Choral Society, Permanent TSB Staff Choir, John Scottus School, Loreto College, Seafield Singers, Dublin Male Voice Choir, the Line Up Choir, Steadfast Band and the Brook Singers. The Black Santa sit out is modelled on a similar appeal, which has been run by successive Deans of St Anne’s Cathedral in Belfast for many years. It became known as the Black Santa appeal because of the long heavy black cloaks worn by the clergy to keep out the cold. This is the 17th year that the appeal has been held in Dublin and in that time well over €500,000 has been raised for local good causes. Among the charities to benefit from the appeal are Trust, the Salvation Army, the Simon Community and the Peter McVerry Trust all of which work with the homeless. Other charities supported include Protestant Aid, Barnardos, St Vincent De Paul, the Laura Lynn Foundation and Solas Project.